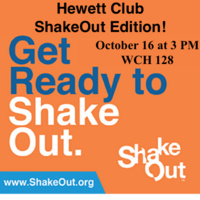 Earth Sciences: Hewett Club Speaker, ShakeOut Edition! This weeks Earth Sciences Departments, Hewett Club Speaker Series is the ShakeOut Edition, to highlight the Great ShakeOut Earthquake Drill happening later this week. Dr. Katherine Kendrick, a US Geological Survey research geologist, who is an expert on the Southern California fault system and its earthquake history, will be giving a talk on Tuesday, October 16th at 3 PM in WCH 138. Her talk will be on "The elusive San Andreas Fault through the San Gorgonio Pass structural knot; Geologic and geomorphic evidence for slip along the San Bernardino strand".